Do you want to help support our mission to save cats lives, provide them with a clean environment, keep them happy and healthy and ensure our success in the future? Consider donating something to the shelter! This page contains a handy list of donations we can use. You can donate via Paypal using the button below. You can still donate if you don’t have a Paypal account – simply use a credit card without creating an account. Paypal guarantees that the personal information used during the transaction will be safe. You can choose to be a monthly donor via PayPal which helps us plan for the future! An Amazon gift card for any amount. We can use multiple cards from different donors to purchase a variety of supplies for the shelter. We have more on Amazon’s site with a handy explanation of what we use these products for, so please check it out! Don't forget to use AmazonSmile for Catman-2 Inc. every time you shop! If you're a wildlife lover, we are involved in small mammal wildlife rehabilitation. Our rehab wish list can be found here. Kuranda products are easy to clean and disinfect. The cats love them and they don’t harbor odor or bacteria from cat messes. You can donate using this link, and the prices are specially discounted for donations. If you are interested in organizing a bed drive for Catman2, contact carol@kuranda.com or call 800-494-7122. 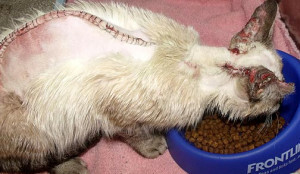 Nadine was almost torn in half by a car engine in January 2013. Your donations helped us save her life and find her a wonderful forever home. Your donations help ensure that when possible, we can give another injured, neglected, abandoned, or abused cat a fighting chance. Will you help them? We have made it easier than ever to help the shelter prosper, so please donate today!